100 years ago – 4th November 1918. Adam Archibald was born on 14th January 1879 at Leith, Edinburgh. The son of Rennie and Christina Archibald, his father was a Plasterer. Adam was educated at Leith Walk Public school and then he attended the local technical school after which he became an apprentice Plasterer in Leith with Stuart’s Granolithic Co. Ltd at Duff Street, and in 1900 he was promoted to Outside Foreman which saw him travelling around Scotland with his work. Adam Archibald enlisted in the 7th Durham Light Infantry on 4th November 1915, before transferring to the 218th Field Company Royal Engineers as a Sapper in 1916. 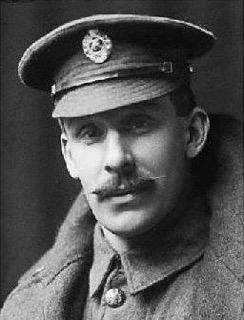 Later that year on November, he went to Chatham and on in September 1917 he embarked with his Company for France. Adam was involved in some heavy fighting during 1918, and on 4th November 1918 the Company was located near Ors, France. In the early hours of the morning of the 4th November just a few days before the end of the War, Sapper Adam Archibald’s unit was attempting to bridge the Sambre-Oise Canal. Along with another engineer, he worked under heavy shelling to construct a floating bridge across the canal. The foot-bridge they were building was to span 50 feet across the canal on which the 2nd Manchester Regiment were to advance to begin their assault. On seeing this, the enemy fired continuously with Machine guns and rapid rifle fire on the two sappers at close range, and used gas to try and stop Archibald and his partner from building the bridge. Under this constant hail of fire, the bridge was completed, the bridge crossed and the operation was a success. Immediately afterwards, Adam collapsed from gas poisoning, which was so severe he was transferred to a hospital at Le Harve. "He was foremost in the work under a very heavy artillery barrage and machine gun fire. The latter was directed at him from a few yards distance while he was working on the cork floats. Though the fire was such that it seemed impossible that anyone could live under it he persevered in his task, and his example and efforts were such that the bridge, which was essential to the success of the operations, was completed very quickly. Just as the work was finished he collapsed from the effects of gas poisoning. The heroism of this sapper was beyond all praise. That anyone should have lived through such a close and accurate fire is little short of miraculous." No. 213078 Spr. Adam Archibald, 218th Fd. Coy., R.E. (Leith). “For most conspicuous bravery and self- sacrifice on the 4th November, 1918, near Ors, when with a party building a floating bridge across the Canal. He was foremost in the work under a very heavy artillery barrage and machine-gun fire. The latter was directed at him from a few yards distance while he was working on the cork floats; nevertheless, he persevered in his task, and his example and efforts were such that the bridge, which was essential to the success of the operations, was very quickly completed. In January 1919 the Leith Observer on report Adam’s award, stated that he was still in hospital recovering, he had been sent to England to recuperate and three months later on 17th April he came home to Leith. Adam Archibald VC was discharged from active service in 1919 and returned to his job at Stuart’s Granolithic Co. Ltd and later became the manager of the Duff Street premises. He attended many public appearances with other VC holders during the years between the two wars, and in although trying to re-enlist during WW2, he was declared “unfit for Military Service.” He dies at his home in Leith on 10th March 1957, aged 78. He was cremated at Warriston Crematorium and interred there. Adam Archibald was a Scottish Freemason. He was Initiated in Lodge Elgin & Bruce No. 1077, Fife and Kinross on 2nd March 1912, Passed 4th May 1912 and Raised 18th May 1912. To commemorate Brother Archibald’s achievement, it was proposed in February 1919, that the Lodge present Bro. Adam Archibald VC with a set of Masonic Regalia and carrying case. It was intended to make the presentation at a meeting on 10th May, but Bro. Archibald wrote to the Lodge informing them that his health was too poor that he could not make the trip. Finally on the 27th December 1919, Lord Elgin on behalf of the Lodge presented the Masonic Regalia as a mark of their appreciation and respect for Brother Adam Archibald VC. Bro. Adam Archibald VC later affiliated to St. James’s Operative Lodge No. 97, Edinburgh.